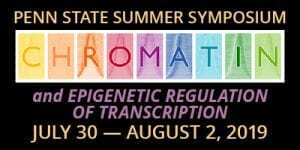 This year marks the 38th consecutive year of the Summer Symposium in Molecular Biology at The Pennsylvania State University. Provide an internationally recognized forum for molecular biology/biotechnology research and education, financially accessible to undergraduate and graduate students, and post-doctoral scholars. Previous speakers include Nobel Laureates David Baltimore, Paul Berg, J. Michael Bishop, Susumu Tonegawa, Aaron Klug, Arthur Kornberg, Gunther Blobel, Phillip Sharp, Thomas Cech, Lee Hartwell, Robert Horvitz, and Richard Axel. The roster of distinguished keynote speakers who have addressed past symposia includes: Alexander Rich, Charles Yanofsky, Joseph Gall, Seymour Benzer, Robert Gallo, Luc Montagnier, Jeff Schell, Gregory Petsko, Peter Dervan, Christopher Walsh, David Felton, George Rose, Harald von Boemer, Thomas Shenk, Ron Evans, C. David Allis, Ulrich Laemmli, Thomas Graf, Stephen Smale, Larry Samelson, Alan Sher, Stuart Orkin, Robert Waterston, Edward Solomon, Lance Seefeldt, Susan Gasser, Robert Roeder, Ronald N. Germain, David H. Raulet, Philippe Gros, Michel Desjardins, Charles N. Serhan, John Milner, Ben van Ommen, Barbara Rolls, Stephen J. Lippard, Harry B. Gray, John Lis, Gordon Hager, Donald McDonnell, Dan Littman, Jacqueline Barton, Markus Ribbe, Andrew Borovik, Carl Wu, Britt Glaunsinger, Julie Pfeiffer, Marco Vignuzzi, Charles N. Serhan, Gary D. Wu, Marcetta Darensbourg, Donald Hilvert and Amy Rosenzweig. Each year a program is developed relative to current research directions in the medical and molecular biological sciences. Since 1982 the Symposium has addressed a broad range of research topics, including: oncogenes, DNA protein interactions, AIDS, neurobiology, nuclear structure, microbial differentiation, plant/bacteria symbiosis, regulation of gene expression, cell cycle control, growth factors and receptors, transgenic expression, molecular interactions in plant development, cell growth and regulation, structure/function in proteins and enzymes, molecular mechanisms of toxicity, chromosomal controls of gene expression, apoptosis, microbial structural biology, immune-neuroendocrine interactions, chromatin structure and DNA function, protein and RNA folding problems, emerging viral diseases, xenobiotic receptors, hematopoiesis and immune cell function, comparative and functional genomics, metallobiochemistry, virology, chromatin and epigenetic regulation of transcription; inflammation, innate immunity, and disease; nutrition, genes and physical activity; and sensing and signaling across the mucosa. Generous program support traditionally has been provided by various industry affiliates, foundations, and by many academic units at Penn State University. Historically, the program has had significant impact on the scientific community in general and has further enhanced the visibility and quality of intellectual life at Penn State University.